In an in-depth interview with the BBC, the 19-time champion jockey said a three-week injury lay-off earlier this season was the "toughest" of his career because it ended his hopes of reaching the 300 milestone. He discusses the decision to retire, injuries and his plans for the future. McCoy spoke to racehorse owner JP McManus, agent Dave Roberts and wife Chanelle before announcing his decision to retire after riding his 200th winner at Newbury on Saturday. "Dave Roberts came for dinner and my wife, Chanelle, had no idea why he was coming down. The only person that I'd really spoken to about it was JP, my boss. "I was a bit low for the next couple of days, so I think I'm going to have my moments. "And then when I rode my 4,000th winner, I was quite happy and people were asking about riding 5,000. To this day I still feel I could ride 5,000 winners, if I wasn't in the position that I'm in. "I've been very lucky all my life and the way it happened at Newbury couldn't have been any better. "It was for JP. I'd ridden a winner earlier in the day on a horse of John Ferguson's to get me to 199. It was my local track, my wife was only down the road. She wasn't even going to come racing until she heard I'd won the first one. "In some ways I wanted to and in some ways I didn't. I would have liked not to have to announced I was retiring." With 200 wins this season, McCoy is 79 clear of closest rival Richard Johnson as the Northern Irishman closes in on a 20th jockeys' championship. "I genuinely think if I retired today and came back as someone else tomorrow, I could ride another 700 winners, no problem. The thing for me was being lucky enough to be in the position I'm in. "I've won 19 jockeys' championships and hopefully this year will be my 20th. You try to achieve that every year and I always had that little fear of carrying on longer than I should do. "I've looked up to leading sportspeople all my life. In the last few years, you look at Brian O'Driscoll, who went out at the top. Sir Alex Ferguson won Manchester United's 20th title and retired. That is the way you should depart, when you're at what you think is the top of your game. "That is the most difficult thing about it because you're leaving when you're still enjoying what you do and at a time when you'd like to carry on, but sometimes you've got to do the right thing. "I thought about leaving it until the end of the year but I didn't want speculation and people writing about it and talking about it. I wanted it to be on my terms." The extensive list of injures McCoy has suffered during his 20-year career includes a broken leg, arm, ankle, both wrists, shoulder blades, collar bones, cheekbones and all of his ribs. He has also broken several vertebrae in his back, suffered punctured lungs and had all his teeth replaced due to racing injuries. 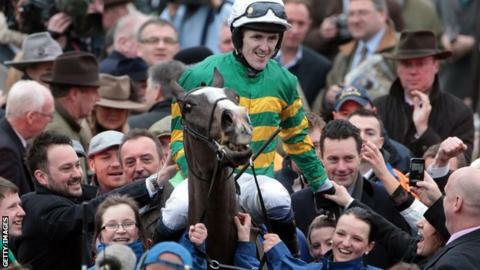 Of all of his setbacks, McCoy said a fall at Worcester in October 2014 was the hardest to deal with because it meant he would not achieve his ambition of riding 300 winners in a season. "I won't miss them but those things challenge you in life and maybe that's the way I am. "I'm the kind of person who likes to be challenged. When I fell, I always felt I could get up again and carry on. "After the fall at Worcester, at the time I was the only one who knew what I was dealing with. I had a punctured lung, I dislocated a collarbone, I had broken two ribs. I went back riding after three days and managed to break the same collarbone I'd dislocated. "I was doing press-ups on the ground to show the doctors it wasn't sore. That's something I don't think I'd have been able to do 15 years ago. It's something I've trained my mind and body to cope with. "I had the aspiration of riding 300 winners at that time and I knew if I wanted to do that then I had to carry on. I couldn't afford the days off but in the end I had to face up to it. "Those three weeks I had off were probably, emotionally, the toughest in my racing career. "At that point in the season I had ridden my fastest 50th winner, my fastest 100th winner, my fastest 150th winner and I thought, 'I can ride 300 winners and this would be the way I'd like to retire'. "I'd have achieved what I have never been able to achieve in 20 years. When that was taken away from me, that's probably the one thing that hit me the hardest." At 17, McCoy rode his first winner in Ireland in 1992 and began racing in England two years later. He says he has no firm plans for his retirement but would like to stay involved in racing. "I'm slightly concerned I have a bit of an obsessive personality. I like to have this idea that I'm going to enjoy my retirement a bit. There's sporting events around the world that I would like to go and see. "If Manny Pacquiao and Floyd Mayweather fought in Las Vegas, I'd like to go and see that. I'd like to go and see Rory McIlroy win the Masters and watch Arsenal win the Champions League final. "I love racing and it's been so good to me. I'm not going to be bitter about the fact I can't ride any more. I'm well aware that this happens to everyone. "Whether it be this year or next year, I know there's going to be a good horse that I could have ridden. I would like to stay within racing and try to do whatever good I can for the sport. "I don't think retiring is anything to be congratulated for. I've been extremely lucky and I know it's the right thing and that the time is right."